Wilbur Ware, bass; Philly Joe Jones, drums. While J.R. Monterose was in chicago about a year ago with Mingus, he heard a young bass player named Wilbur Ware, and filed the name mentally for future reference. Ware later came to New York, along with Ira Sullivan, as a member of the reorganized Jazz Messengers. Sullivan is one of those extraoridary musicians who can play virtually every instrument. Ira's trumpet and Wilbur's bass are allied here with the drums of Philly Joe Jones, whom J.R. had admired so much during his tenure with the Buddy Rich band, and the piano of Horace Silver. Speaking of the material used for his first session, J.R. says, "I was afraid it might sound like too much of me if we used nothing but my own tunes. Horace brought in the numbers by Byrd and Paul Chambers, and when I asked Joe if he had anything, he came up with "Ka-Link," so I think we have enough variety in the material to avoid monotony." "Wee-Jay," a Monterose original based on the chord changes of "Out of Nowhere," kicked off the proceedings in an auspicious manner, as J.R.'s solo, with the repeated staccato third in the opening measures, shows the powerful swinging tendency that is maintained through three superb choruses. Ira's trumpet takes a few bars to get going, but by the end of the first chorus he is really cooking, and in the second he is clearly inspired. Horace's two choruses are simple and direct. The drums and bass trade fours for one chorus, then the theme returns and there is a pleasant retard at the end. "The Third," a minor opus by Donald Byrd, is based on a 12-bar construction, with solos by Horace, J.R., Ware and Ira. 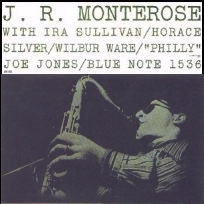 Notice the apparent Sonny Rollins influence in J.R.'s work here and the fine form and phrasing on Ira's solo. "Bobbie Pin," a happy-sounding, medium-fast opus, gives Ira the first solo, followed by a bass chorus that is almost guitarlike in the flexibility of its concemption. J.R.'s solo here is particularly well-constructed and swings consistently After Horace's choruses, there are a series of fours by tenor and drums before the theme returns, going out with an unexpected Latin-rhythm fade. "Marc V" moves like mad, with Ira backing J.R. on the latter's second and third choruses, then taking a couple of his own. Following the piano and bass solos, Philly Joe gets a workout on this one with a few breaks before the theme returns. "Ka-Link," presumably a sound effect title for the cymbal beat that kicks it off, features J.R. in a long string of 12-bar choruses. "Beauteous," [mp3] written by bassist Paul Chambers, is a smooth unison theme played in a tempo that might be considered moderato by modern jazz standards, and using Latin rhythm on the release. After the Monterose and Silver solos, Horace has an interesting contribution that stays almost entirely within an octave or so of middle C. Wilbur Ware has a quietly effective chorus before the reprise of the theme. Too many musicians in recent years have been afforded the opportunity of making their own LP before they were quite ready for it. Fortunately, in the case of J.R. Monterose, it is abundantly clear that he waited until the propitious moment, and that he was as ready, willing and eager to prepare this session as his rapidly-growing fan following should be to receive it.